Trying to multitouch-touch-touch your Mac's screen, as Steve Jobs said, would make your arm want to fall off. But OS X Lion is without a doubt Apple's most touchable operating system to date. So how are they gonna do it? So it turns out "Back to the Mac" was more like "Back to the Mac Future." The event's titled alluded to the fact that Mac OS X Lion will be beefed up with many of the philosophies and features that were pioneered by the iPad and iOS. And what that means, in a word, is touch. But that doesn't mean that you'll be poking at the screen of your MacBook. 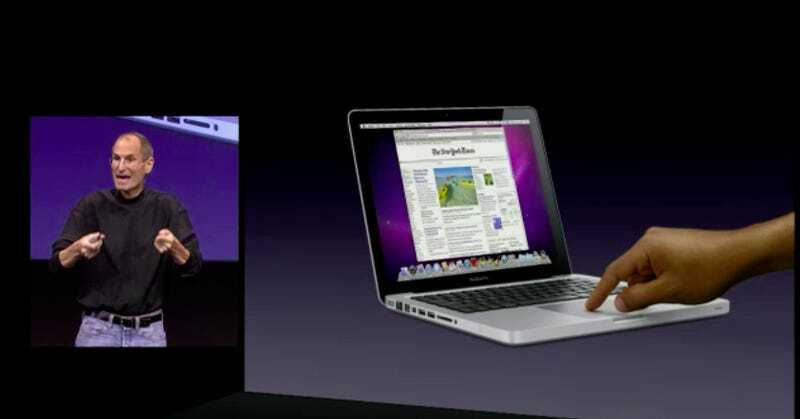 The paradigm for touch on Macs and MacBooks is horizontal. Steve said that Apple is proud of the trackpads on their MacBooks, and then of course there's the Magic Trackpad and the multitouch-enhanced Magic Mouse. The writing was on the touch surfaces. All of the software Apple announced today—the shiny new iLife, Mission Control, and the gesture-enhanced OS X Lion—points to a future in which you're not just clicking things but touching them. Scrubbing your finger over thumbnails to preview the files inside of them. Viewing apps in fullscreen, sans menu bars and docks. But your arms don't have to worry about Apple's touchscreen future. Your fingers won't be moving across your screens, they'll be dancing across your desk, just like you're used to.